In literary fiction, Hibbert recommended Ewan Morrison’s Nina X, published by Little, Brown’s Fleet imprint, about a young woman born into a Maoist cult, with no concept of the outside world. Inspired by a real event, Morrison’s story describes Nina X’s escape from the cult and her cluelessness about the contemporary world. “It’s terribly sad and funny at the same time,” said Hibbert. A Boy and his Dog was just sold at auction to Blanvalet Verlag. Yulia Borodyanskaya at Abrams, which will be celebrating its 70th birthday in 2019 and bought itself an early birthday present by acquiring Overlook Press, said that with Overlook, the illustrated book publisher will be able to launch into fiction as well. Abrams recently moved into narrative nonfiction with the Abrams Press imprint. Borodyanskaya pointed to two titles within this imprint: The Great Great Wall, Along the Barriers of History from Hadrian to Trump, by architectural historian and critic Ian Volner examines the historical and contemporary fascination with walls, and the cultural and sociological implications behind the construction of these walls. Ten Drugs, How Plants Powders and Pills have Shaped the History of Medicine, by Thomas Hager looks at the ten most used medicines and their history. For kids, Abrams is now producing chapter books in their successful Questioneers series, which began with picture books. 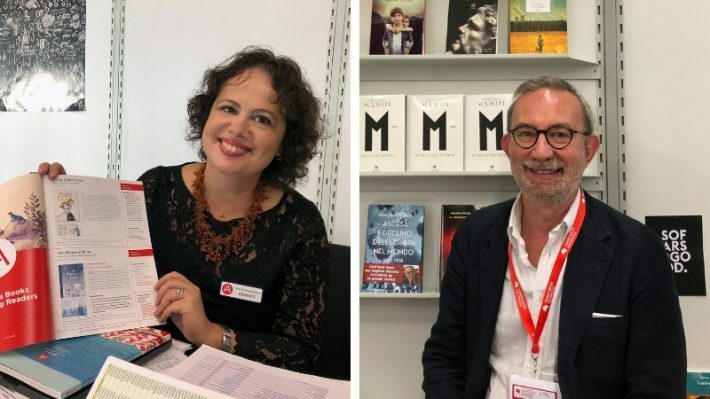 Within the LitAg, Marco Vigevani and Claire Sabatié-Garat of The Italian Literary Agency were on a roll. They represent the author Antonio Scurati, whose novel M, il Figlio del Secolo (M, the Son of the Century) published by Bompiani on September 12th is generating plenty of interest. The fictionalized account of Mussolini’s rise to power between 1915 and 1925 is historically accurate with intricate details. In a country which veered to the right in recent elections, and in which the rise of neo-fascism has brought the shadow of Mussolini to the fore, to say that Scurati’s book is timely is an understatement. “It describes a person who is hollow and who becomes a receptacle for the post [World War I] frustrations,” said Sabatié-Garat. Cinema and TV rights have been sold to Wildside/Freemantle, which produced Elena Ferrante’s My Brilliant Friend, and in a preempt Alfaguara acquired world Spanish rights and Fraktura acquired rights for Croatia.